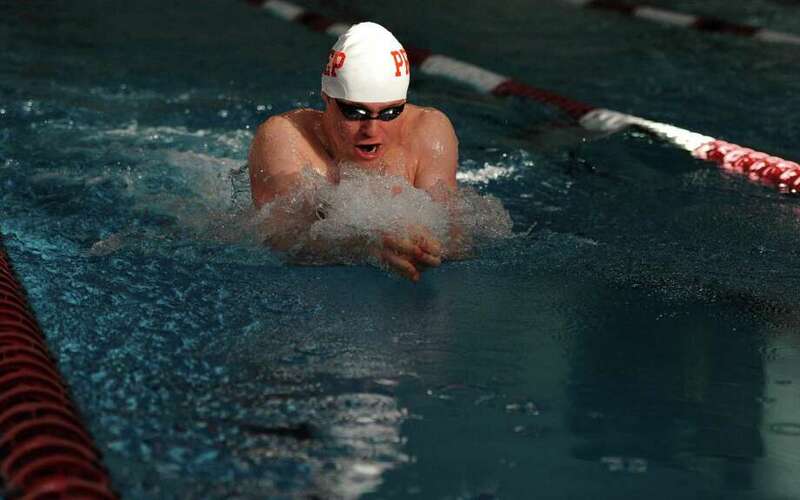 Led by two-time individual medalist Bryce Keblish, Fairfield Prep won its 11th consecutive Southern Connecticut Conference swimming championships, scoring 1,083 points to hold off second place Cheshire last weekend at Wesleyan University. "It was probably one of the closest meets we've had of the 11 that we've won," Prep coach Rich Hutchinson said. "But it was a great team effort from us. We don't have the top end firepower that we've had in the past and we asked a lot of our underclassmen and they really came through." Keblish, a senior, won the 200-yard freestyle (1:41.25) by a dominating four seconds and later captured the 100-yard backstroke (:54.17) in addition to helping the Jesuits place third in the 200-yard medley relay and second in the 400-yard freestyle relay events. "Bryce has been great all season," Hutchinson said. "When you have that level of swimmer that you can rely on, it gives the team a big boost knowing that someone is going to be there and in championship meets, know that we can lock down a couple of wins. Bryce has been our go-to guy for that all season long." Keblish, along with senior Alejandro Ramos, junior Guido Balderamma and freshman Oliver Rus timed in at 1:42.78 in the 200-yard medley relay while junior Gianni Leito placed 10th (1:53.51), freshman Benjamin Fox 12th (1:54.46) and freshman Joseph Hopkins 22nd (2:01.72) in the 200-yard freestyle. In the 200-yard individual medley, sophomore Andrew Magel finished ninth in 2:09.64, sophomore Kevin Lydon was 11th (2:10.96) and sophomore Michael Riina was 14th (2:12.43). Rus finished third in the 50-yard freestyle in 23.31 seconds while another freshman, Stanislav Yarmoussik, took ninth (23.64), sophomore Sean Paul Stolarski finished 11th (23.75), sophomore Martin Duffy finished 14th (24.02), senior Cameron Thomas was 16th (24.18), junior Vincent Farricielli was 26th (25.01) sophomore Riley O'Boyle was 28th (25.33), sophomore Jerome Larracuente was 30th (25.45), and senior John Thornton was 37th (25.95). In the 100-yard butterfly, Prep's Balderamma finished fifth in 55.71 seconds, sophomore Andrew Magel was 11th in 59.42, Ramos was 17th in 1:00.75 and sophomore Christopher Giannini was 26th in 1:04.06. "We had a lot of underclassmen step up for us," Hutchinson said. "Oliver Rus, he's been great, Stan Yarmoussik is another. Ben Fox, he's done very, very well. To have underclassmen perform like that and score big points in big meets, you don't see that too often. They played a very big role in us pulling this out." Stolarski took eighth in the 100-yard freestyle, finishing in 51.52 seconds with Camerson Thomas placing 15th in 52.41, Yarmoussik was 16th in 52.70, Martin Duffy was 19th in 52.87, O'Boyle was 23rd in 54.12, Joseph Hopkins was 29th in 55.69 and Jerome Larracuente was 34th in 56.27. In the 500-yard freestyle, Leito finished eighth in 5:04.40, Ben Fox took 12th in 5:11.89, Christopher Fusco finished 14th in 5:17.06, Michael Rinna was 19th in 5:24.93, William Duffy was 27th in 5:42.33. In the 200-yard freestyle relay, Yarmoussik, Rus, Duffy and Stolarski finished third in 1:33.85, while in the 400-yard freestyle relay, Prep took second (3:21.22) behind Stolarski, Yarmoussik, Balderamma and Keblish. In the 100-yard backstroke, Balderamma finished sixth in 58.53 seconds, Ramos placed ninth in 59.56, Fusco was 10th in 59.79, Christian Quinones was 30th in 1:08.70 and Adam Pysk was 31st in 1:09.97. "Guido has been terrific for us," Hutchinson said. "He's been battling an ankle injury of late and this was his first meet back. He's been a rock for us as well as Bryce. He's very versatile and he's willing to do anything for us and a coach couldn't ask for anything more." In the 100-yard breaststroke, Prep's Rus took sixth in 1:05.53, Kevin Lydon finished 10th in 1:06.93, Vincent Farricielli was 20th in 1:09.76, Alexander Ney was 24th in 1:11.78, David Carron was 26th in 1:12.98, Choulhyun Park was 30th in 1:14.27 and Nicholas Allen was 39th in 1:19.21. Lastly, Prep's three top divers, seniors Robert McCrory, Jackson Rotondo and Michael Connelly, finished third, fourth and fifth, respectively in the SCC meet. "Our divers were a key component the (SCC) win, they were absolutely fantastic," Hutchinson said. "We have three senior drivers that have come through all season long for us." Next for Prep is the Class LL meet, which starts tomorrow at Wesleyan University. The Jesuits have finished second in the state meet eight times in the last 10 years, while winning the LL crown in 2012 and the Class L title in 2007. "This will be a little different, your team depth doesn't come into play as much," Hutchinson said. "The top-end swimmers play a bigger role, so we're going into it all in and see where the chips fall."